To do lists don't need to be complicated–some people use pen and paper for the job, after all. And yet there are seemingly infinite to do list apps out there. Why? Because keeping track of and organizing your tasks is an intensely personal thing, and everyone wants to do it a little differently. 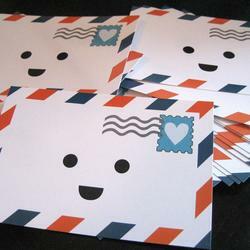 This makes designing a to do list incredibly difficult: it's impossible to offer one design that makes everyone happy. And it's particularly hard to make Mac users happy. They, perhaps more than users of any other platform, are picky and expect things to look and work a certain way. Applications that don't feel like they were designed for macOS are distracting because things like keyboard shortcuts, notifications, and menus don't work the way they do in other applications. 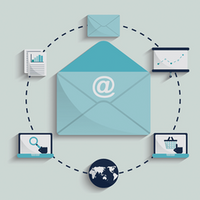 That disrupts your workflow, which defeats the entire point of productivity software. Offer a clean interface, with native macOS features like notifications, widgets, and integration with the menu bar. With these criteria in mind, here are the best to do list apps you can find for macOS. All offer free trials of some sort, so try out anything that looks useful to you. 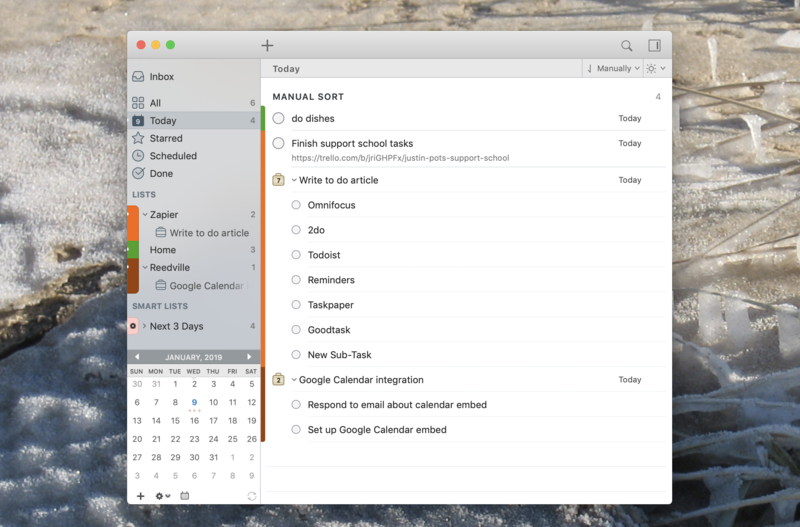 Open Things for Mac and it looks simple: You've got an Inbox for your tasks and the option to add more lists. Dig a little, though, and there are all kinds of advanced tools here. There are nesting ways to organize your tasks: Areas can contain tasks or projects; projects can contain tasks or headers that can also contain tasks; even tasks can contain sub-tasks if you want. It sounds confusing but it isn't, which really speaks to how well Things is designed. There's no right way to use this system: Use as many or as few of the organizational options given to you, however you like, to make sense of your chaotic list of tasks, choose which things you want to do today, and then do those things. Other applications offer features like this, sure, but Things manages to do so without feeling cluttered. And as a native application with no Windows or web equivalent, Things feels very much at home on the macOS desktop. Combine this blend of functionality and beauty with features like a system-wide tool for quickly adding tasks, integration with your calendar so you can see your appointments while planning your day, intuitive keyboard shortcuts, reminders with native notifications, integration with over 1,000 apps via Zapier and syncing to an iPhone and iPad app. 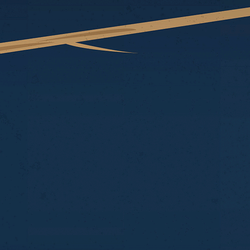 It's a powerful way to organize your tasks–and then accomplish them. Most Mac users stay within the Apple ecosystem…but not all of them. If you need to sync your tasks from macOS to Windows, Android, or basically any other non-Apple option, Todoist is one of the first applications you should check out. 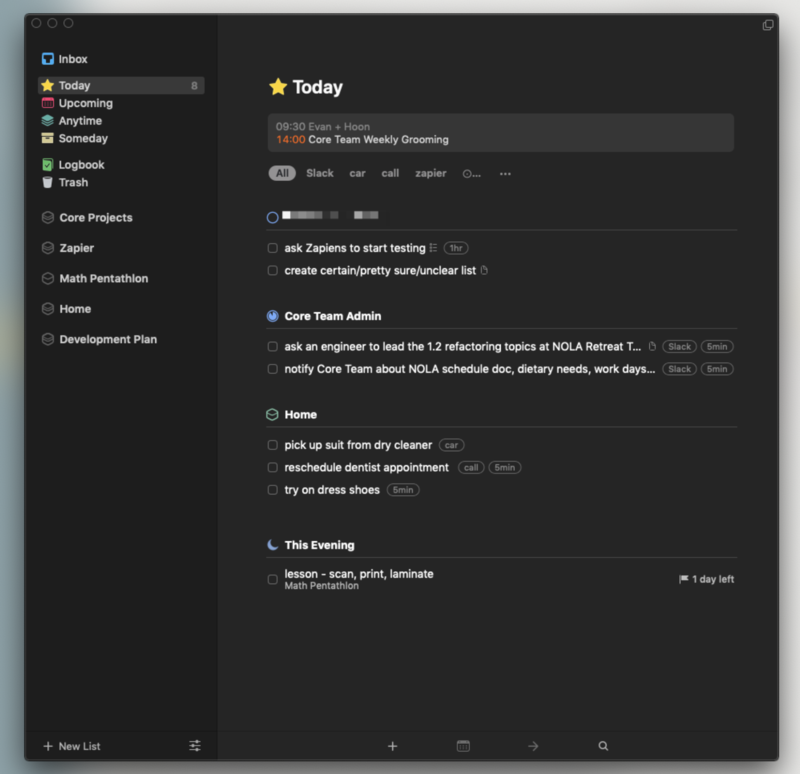 Like Things, it's deceptively simple but has all kinds of advanced task management features hidden just below the surface, though Todoist does feel a little less at home on the Mac desktop. That's because the macOS application of Todoist is basically the web version in a dedicated window. There are a few native Mac features: notifications, a menu bar icon, and a Today widget. And there's also a universal keyboard shortcut for quickly adding tasks, and that alone makes the Mac app worth installing for Todoist users. Having said that, Todoist is a solid application. 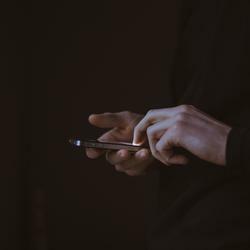 You can arrange your tasks in all sorts of meaningful ways, sync them everywhere, and never worry about not having access. If you're particular about how your tasks are arranged, and I mean really particular, OmniFocus is right for you. This application is a power user's dream, allowing you to organize your task in seemingly never-ending variations. 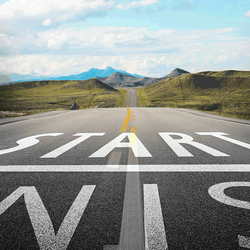 There are three different kinds of projects you can set up, for example. 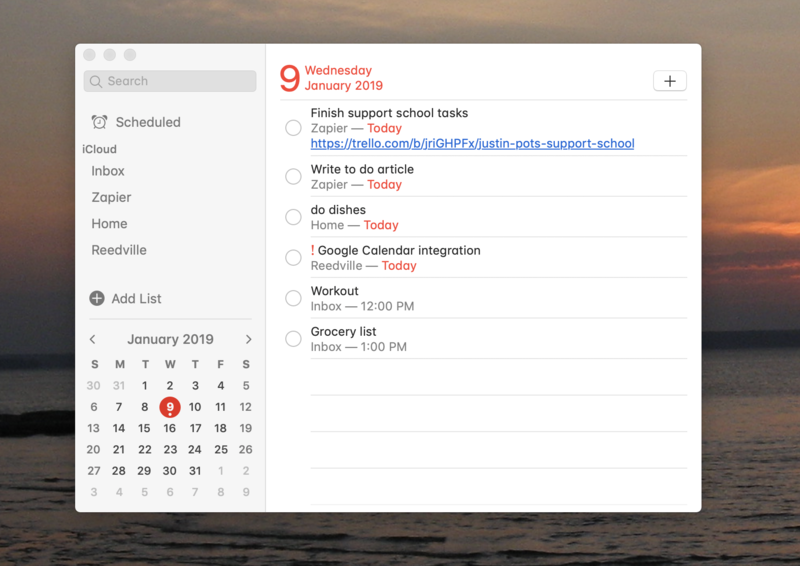 There are six main views by default, ranging from the Inbox for unsorted tasks, Forecast for seeing scheduled tasks in context with any of your macOS Calendar appointments, and Review for going over completed tasks at the end of the day or week. You can also create your own views if this isn't enough for you. You can even integrate Omnifocus with 1000+ applications via Zapier, if you want. This isn't an application that's quick to learn, and things can feel cluttered at times. Once you figure everything out, however, you'll have an elaborate, GTD-style task list that works exactly the way you want. Combine this with a system-wide keyboard shortcut for quick task entry and you've got no excuse when it comes to keeping things organized. OmniFocus price: OmniFocus for Mac starts at $39.99 after a 14-day trial. The Pro version, which allows you to customize the sidebar with your own views among other features, costs $79.00. The iPhone and iPad version starts at $39.99, and also offers a 14-day free trial. The best to do list is the one you have with you, right? If you own a Mac you already have Reminders, which comes free with every Apple device. Apple's default application for managing tasks is a simple one, allowing you to create lists of tasks and schedule when you'll do them. 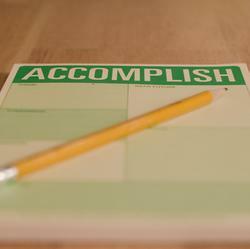 You can then view those tasks or view any day's worth of tasks across all lists, and that's about it. But this simplicity might be a big plus: You get in, add tasks, and then get to work. There's no universal keyboard shortcut for adding tasks, but there is integration with Siri for Mac, which is something no other app on this list can claim. And iCloud integration means you can sync tasks with your iPhone and iPad very easily. You've already got this application so why not give it a shot? Reminders price: Included with all Macs, iPhones, and iPads. Reminders is great but not exactly feature rich. GoodTask is unique in that it uses Reminders as a backend–add anything to GoodTask and it will show up in Reminders and vice versa. So what's the point? 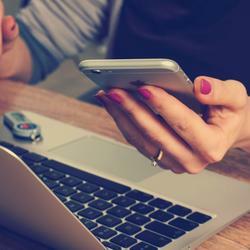 GoodTask offers features that Apple doesn't in Reminders. First there's Calendar integration, meaning you can see your calendar appointments and your tasks in one place. You can also create smart lists, allowing you to filter your tasks using things like tags, due dates, and locations. You'll have to spend some time setting this up before it's any better than Reminders, but if you've got a specific overview of tasks in mind you can probably design it here. GoodTask also offers a fully customizable Today widget, which isn't something offered by any other application we tested. Integration with Reminders means all your tasks sync to the iPhone and iPad without the need for any other software, though there are versions of GoodTask available for those devices if you want the same power on those devices. There are a few downsides. There's no universal keyboard shortcut for creating tasks, though thanks to Reminders integration you can use Siri for Mac instead. Overall, GoodTask is a nice little upgrade over Reminders. GoodTask for Mac price: $19.99 with a 14-day free trial. GoodTask is also available on Setapp, which is a $10 a month subscription service with access to dozens of Mac applications. There's also an iPhone and iPad version available for free, with an in-app purchase of $9.99 to unlock all features. 2Do fits right in on the Mac desktop. It looks a little cluttered at first glance, but it's also really powerful. You can create lists, then put projects or checklists inside those lists. You can add tags and due dates. 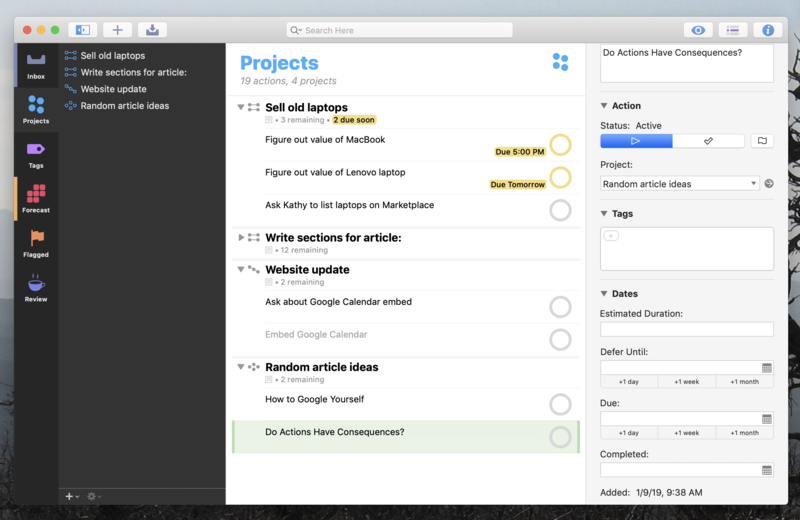 You can create smart lists, allowing you to view your tasks however you like. And there are a way more options than that if you're willing to put the time in. This is a power user's to do list, which you can bend to just about any workflow. It's going to take you while, but it's going to be worth it. There's no calendar integration, which is unfortunate, but there are plenty of other integrations with the rest of your system. A universal keyboard shortcut makes it quick to add new tasks, notifications let you know about upcoming deadlines, and there's even a handy Today widget for quickly checking off tasks. Syncing is unique here because there are multiple options. You can sync to the iPhone or Android version of 2Do using iCloud, Dropbox, Yahoo Calendar, Fruux, Toodledo, or any CalDAV server. You can also access synced tasks on any of those services, albeit without the 2Do specific features. It's a wide range of syncing options, beyond what any other app here offers, so give it a spin and see how it all works for you. 2Do for Mac price: $49.99, and there's a 21-day free trial. 2Do is also available on Setapp, which is a $10 a month subscription service with access to dozens of Mac applications. Wondering why to do lists have to be so complicated? TaskPaper isn't. 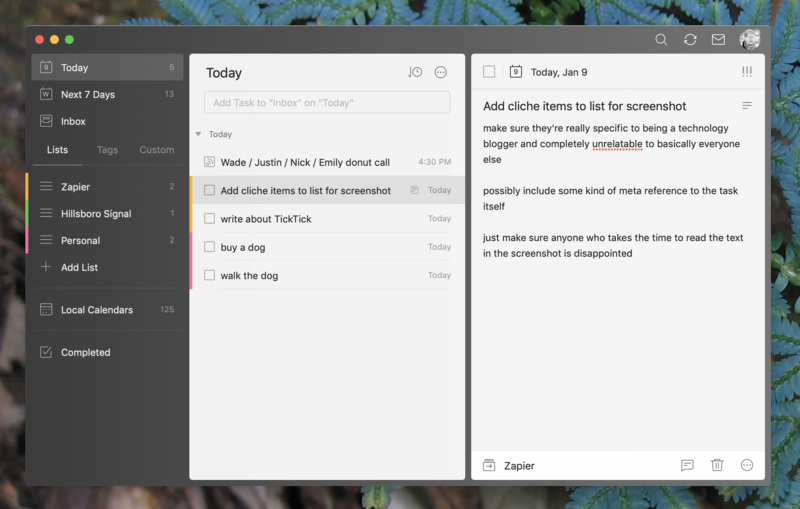 This text-based option means you can just start typing to create your to do list. Projects end with colons; tasks begin with a hyphen; tags start with the @ symbol. It sounds simple but it's surprisingly powerful once you get used to it, especially with the filtering and search options. There isn't an iPhone version, but the third party application Taskmator ($4.99) is compatible and syncs using Dropbox. 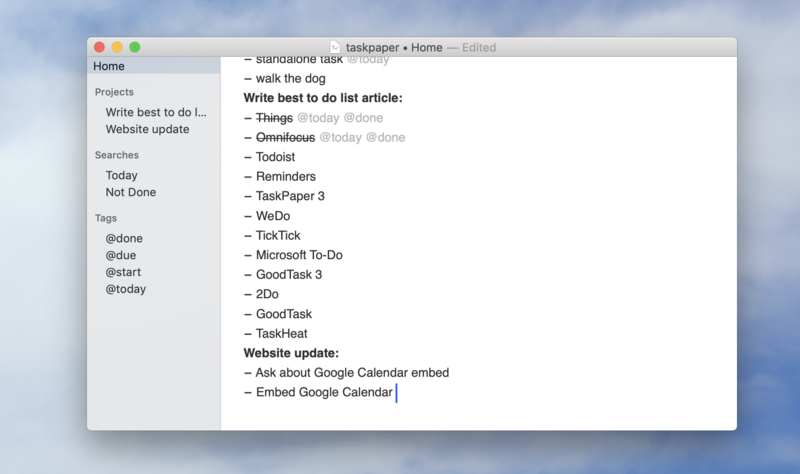 Alternatively, you can set up TaskPaper to sync over items from Reminders. Taskpaper price: $24.99 with a free trial. Taskpaper is also available on Setapp, which is a $10 a month subscription service with access to dozens of Mac applications. TickTick is a straightforward to do application you can run on basically every platform on earth. Unlike other cross-platform applications, however, TickTick actually feels like a native Mac application. 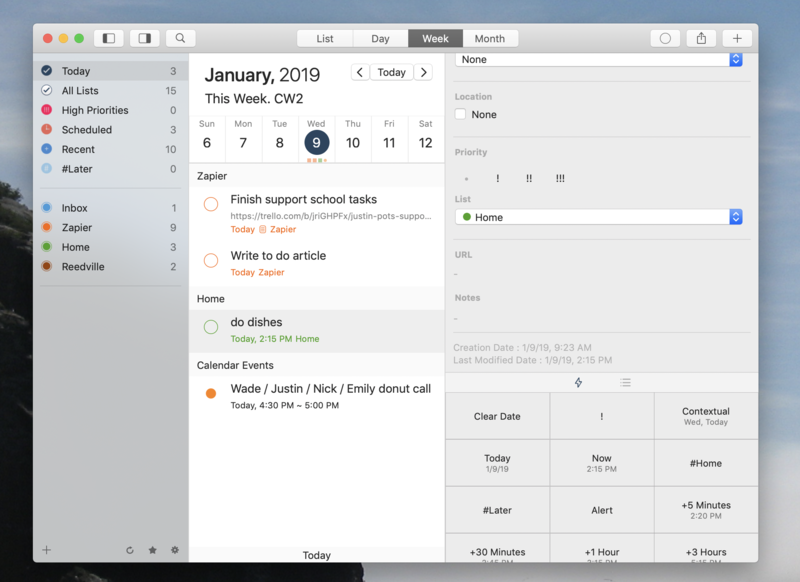 Some of this is good design choices, but there are also features that make TickTick stand out: menu bar icon with a miniature version of your list, integration with appointments from Calendar, and native notifications. There's also a keyboard shortcut for adding tasks from anywhere. 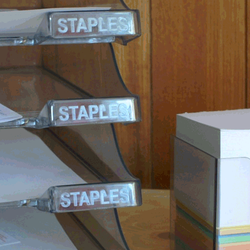 Organizing your tasks isn't complicated: you have lists, tags, due dates, and that's about it. But there are a few features here that other applications don't offer, including a built-in pomodoro timer. Try out TickTick out if you're looking for something straightforward, particularly if you need to sync over to non-Apple devices. TickTick price: Free, but premium features like a monthly calendar view and custom smart lists require a $2.99 per month subscription. Trello isn't a to do list per se but you can use it to organize your life and there's a Mac app with native notifications and system-wide keyboard shortcuts. 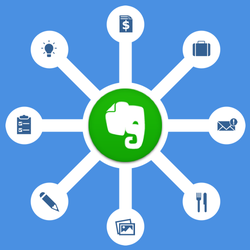 Evernote, OneNote, or any other note taking application can work very well as a to do list, and most offer a Mac app. 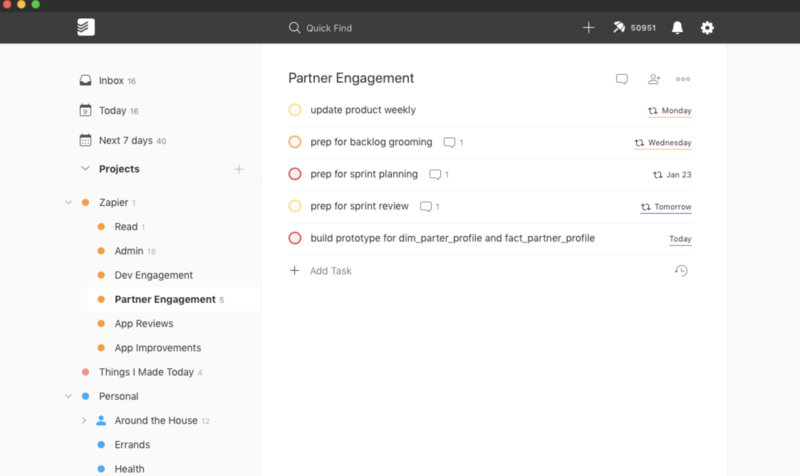 TaskHeat allows you to organize your to do list as a flowchart, which is neat, but it can't sync with any other platform. Wunderlist used to be a no-brainer for lists like this and is still quite nice. The problem: Microsoft bought Wunderlist and is shutting it down at an undetermined point in the future. The replacement, Microsoft To-Do, is missing key features and does not offer a Mac application. Todo.txt is an open-source standard for storing your to do list in a plain text document. The command line app runs in the macOS Terminal, allowing you to add and manage tasks with commands. If that's not your style, TodoTxtMac is a nice GUI for the same standard.